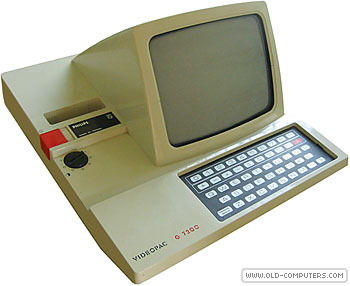 The Videopac G7200 is basically a Videopac G7000 or Videopac C52 (see this entry for more info) with a 9'' (23 cm) built-in black & white display. As said above, the display is only black & white, which makes some Videopac games difficult to play when there are based on color shapes and objects. The G7200 was to be used when the "one family TV" was occupied by the parents. The G7200 could then be (not easily for a children) moved to a bedroom for endless fun (as they said). And when the main TV was free, it was possible to connect the G7200 to it, and to enjoy crisp & colorful display through its SCART video cable! The two controller connectors are placed discreetly on the front side, under the keyboard. There are three different knobs to adjust diffetent settings : display contrast, display brightness and volume control. Quite handy. Schneider and Radiola also marketed this model under thier own brand : Schneider 7200 and Radiola JET 27, both using a blue case. Philips even marketed later a compacter model called Philips N60, using a Minitel 1A (french teletext terminal) case. see more Philips Videopac G7200 Ebay auctions !